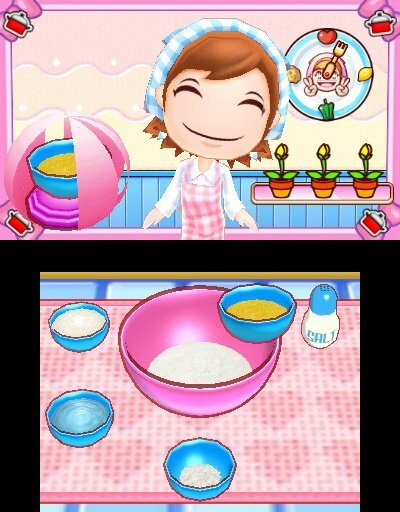 Majesco’s Mama is nothing if not prolific; with nearly a dozen main titles and spin-offs on DS, 3DS, Wii, and iOS, spanning genres as diverse as gardening, babysitting, and crafting, it’s easy to forget that it all started with a whisk in 2006’s Cooking Mama for the DS. 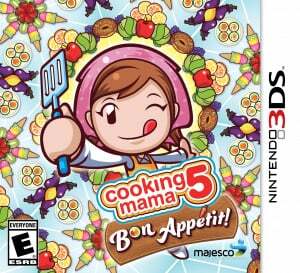 Mama may have branched out since then, but her flagship title’s stayed a steady course of cooking fun across several sequels, including Cooking Mama 5: Bon Appétit, the newest 3DS release in the series. A serious lack of challenge means it won’t be for everyone, but kids and foodies with a taste for cute cuisine and simple, stylus-based mini-games will find plenty to like in Mama’s latest culinary adventure. 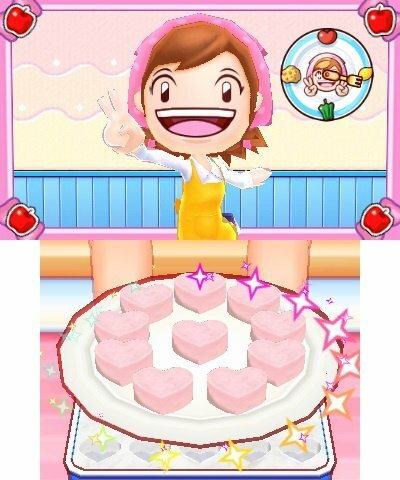 Stepping into Mama’s kitchen, most players will want to head straight for Let’s Cook, the bread-and-butter of the Cooking Mama experience. Here you’ll find sixty recipes for everything from sweet treats and appetizers to full meals and more, and while the menu tends towards traditional Japanese dishes, there’s a wide range of flavours overall. Whipping up each dish is accomplished via a series of discrete micro-games, which use a combination of stylus, tilt sensor, and microphone inputs to craft a fun, arcade-style cooking experience. To make mouthwatering mochi, for example, you’ll first need to grate some white radish by sliding the stylus left to right, and tapping to clean out the grater. Then you’ll mince green onion with rapid-fire tapping, stir soy flour with carefully timed taps, and squeeze edamame out of their pods with gentle stylus flicks, before grinding up the mixture in a mortar and pestle by spinning the contents and flicking them back to the centre to regroup. Once that’s done, you’ll need to wash the rice — tapping to add water, spinning to rinse, and tilting the 3DS to drain the bowl — and then steam it by dragging it to the steamer, folding over the cloth, and pressing to turn up the heat until you’re happy with the result. Next, you’ll pound out the mochi mix with rhythmic hammer hits, pinch off smaller pieces by sliding and flinging, and finally coat each piece by placing it in the appropriate tray and tapping, flipping, or twirling, depending on the topping. The individual tasks in each recipe are simple and straightforward, and while they don’t offer much in the way of challenge they use the 3DS in fun ways that kids will get a kick out of. It’s easy to pick up, and it’s also a lot of fun — twirling, sliding, and tapping to cook feels a bit like a more sedately-paced, food-based take on the WarioWare formula, and the stylus control gives a sense of hands-on satisfaction to your homemade creations. There’s also a bit of room for creativity in some dishes; the last step in making sushi balls is to choose your favourites and arrange them as you like in a handsome presentation box. There’s a good deal of variety in the stylus actions — cracking an egg feels totally different from sifting flour — but since recipes use similar techniques, you’ll become familiar with the basic building blocks over time. 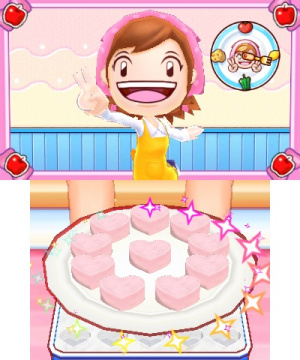 Rather than feeling repetitive, it actually lends a nice sense of progression to the prep-work; recognizing what to do when you see a certain ingredient or step will make you feel like you’re learning to cook — in Cooking Mama’s world, at least — and the “I know what to do here!” moments will be especially satisfying for younger gamers. For the most part, everything feels nice and responsive, too; aside from a few finicky inputs, the only major misstep is with certain rhythm-game-like sections, which rely on visual timing cues that don’t actually sync up with the background music. They’re certainly serviceable, but they always feels a bit off, and will require some serious reflex suppression from musically-inclined gamers. While the controls are generally spot-on, Mama doesn’t demand the same degree of precision from her players; the grading system in the main Let’s Cook mode is extremely generous, forgiving all but the most egregious errors and handing out positive reinforcement at every turn. Tilting a strainer too far and spilling all our carefully cooked rice into the sink, for instance, merited an approving thumbs up and a ‘Not too bad!’ from Mama. It keeps things friendly and accessible for everyone, including younger players, and makes each recipe an experience to enjoy rather than a challenge to overcome. 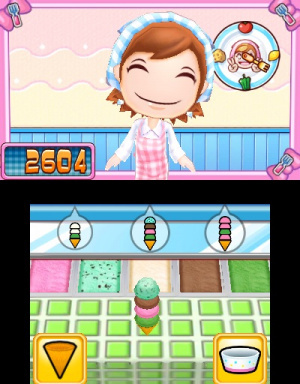 In fact, beyond simply tolerating mistakes, the game builds in fun ways to fix them; when we over-mixed batter, for example, spilling it all over the screen and Mama’s unsuspecting face in our rush to the oven, we were able to clean it up with a quick, on-theme wipe of the touchscreen. And after accidentally smashing long-suffering Mama’s hand with a mochi-pounding mallet, we were calmly instructed to blow on the 3DS’ microphone to bring down the swelling before returning to the task, guilt-free and with Mama no worse for the wear. If you do feel like being judged, however, Mama’s more than happy to oblige in the Cooking Dojo. This is Cooking Mama 5’s Iron Chef equivalent, where you’ll be graded on time and accuracy, and can compete for bronze, silver and gold medals in each recipe. Any dish you’ve already completed in Let’s Cook can be attempted in the Dojo, and the time attack-style gameplay makes for a nice change of pace — though it’s worth noting that even in the Dojo, most players will be able to breeze through everything without much resistance. Cooking Mama has a broad appeal, and its target audience definitely includes less experienced gamers — a fact reflected in the appropriately accessible challenge. 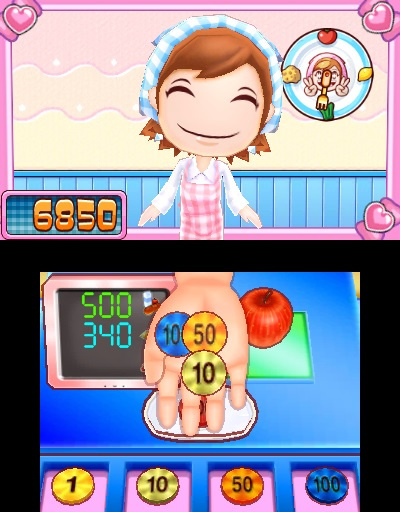 For those truly in need of competition, Cooking Mama 5’s local multiplayer lets two cooks face off in the same kitchen. It’s Download Play only, so you’ll only need one copy of the game to get going, but the fact that it’s restricted to fifteen individual tasks instead of full recipes dampens the fun somewhat — you can see who can crack eggs, pull off strawberry stems, or sift flour the fastest, but competing to make the best parfait or party platter sadly isn’t an option. Let’s Cook, the Dojo, and the Download Play multiplayer offer up plenty of cooking content on their own, but there’s also a generous helping of additional, out-of-kitchen activities sprinkled throughout several extra modes. Let’s Help Mama lets players help out around the house in comparatively enjoyable chores like feeding pets or flicking spools of thread onto a moving target, Let’s Help Harvest sends players out to the garden, where they can gather ingredients through picking games and sorting puzzles, Let’s Help in the Shop tasks players with serving the food they’ve been making by taking and delivering orders in a café setting, and Let’s Study presents a suite of simple, Brain Age-lite style exercises with very basic maths and word games. These side-dishes lack the consistency and immediate appeal of the main attraction, but they’re welcome additions nonetheless, and with several mini-games apiece there’s at least a few fun ones in each bunch. Finally, a Gallery mode lets players customize Mama’s clothes, house, and kitchen equipment, with different styles unlocked as rewards for progressing through the main game. No matter how you decorate it, Mama’s kitchen is always sparkling — Cooking Mama thrives on cuteness, and that runs throughout the game’s presentation: sunny and colourful, with clean lines and a pastel coat of paint, it’s smile-inducing at every turn. The actual in-game 3D models aren’t particularly impressive, and apart from a muted stereoscopic effect there’s nothing here that wouldn’t be possible on a DS — but what it lacks in technical prowess it certainly makes up for in charm. The music carries that appeal over into the audio department, with an upbeat, old-timey jazz combo of clarinet, brushed drums, ragtime piano, and walking bass acting as Café Mama’s house band. 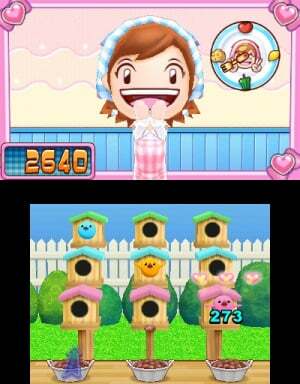 Cooking Mama 5 isn’t the deepest or freshest experience around — it’s an iterative rather than innovative entry in a series whose core concept of stylus-based cooking gameplay remains the same as ever — but for the right audience it’s a whole lot of fun. 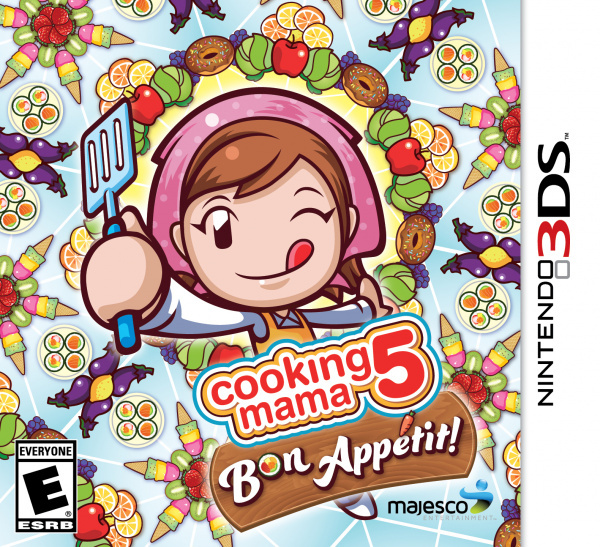 Master chefs looking for a challenge won’t find much to satisfy them here, but series fans, younger gamers, and anyone with an appetite for fine food, cuteness, and simple mini-games will definitely enjoy what Mama’s got cooking. Can you smell what the Rock is cooking? Well, no, but I can't smell what Mama is cooking either. But compared to Cooking Mama World: Babysitting Mama, I wonder if this type of iterative sequel is still preferable to innovative. Well Gardening Mama 2 and this will be in my daughter's stocking this Christmas! I might pick this up, sometimes I prefer simplistic experiences. And I like stylus based mini games. How would this stack up against Cooking Mama 4? While I do like it, it rings too close to the original game and I'd like something different. If you smelllllllllllll what the Mama. Is. Cooking! Can't smell, taste or feel the stuff yet? Pfffft, Im not being fooled again! Cool. I will play it! @Sergio151: Wasn't there a problem with the timings which made the tougher sections almost unplayable?